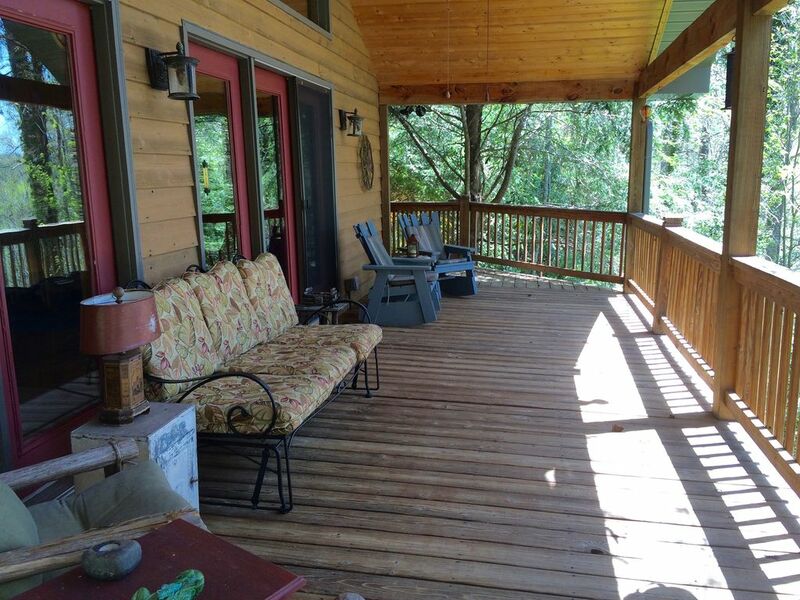 We highly recommend Laurel Loft Cabin. We really loved the place. The Cabin was spotless, very nicely decorated and so well equipped with absolutely everything that was needed. It was quite roomy and very private -- just perfect for two couples. We especially enjoyed the wrap-around covered porch with the comfortable furniture. Also, the thermostatically controlled gas fireplace which made the living room look like a beautiful postcard. Since we live in Southwest Florida, the cooler temperature was a welcome relief after our extra warm summer. Although we have had many trips to the North Carolina mountains, this was the first time that we had experienced the Highlands. We found it to be a delightful town and got some great local advise from the Visitors Center in downtown Highlands. We enjoyed our visit to the Highlands!! We were extremely happy with our stay in our cozy, lovely cabin in the serene, peaceful mountains! My husband & I looked forward to our morning coffee in the mornings on our gorgeous deck with breathtaking views! We enjoyed every amazing day of our stay!! Lovely place. Close to town! Very clean and charming home. Excellent for two couples. A charming cabin in the woods! Felt like we were in a large treehouse! We loved this cabin. It is so cozy with a perfect layout for two couples. It was well stocked with everything we needed. We enjoyed sitting out on the deck at night. The wildlife there was abundant. We saw chipmunks, squirrels, humming birds, flying squirrels, raccoons, and a special treat were the black bears! The weather was cool which just added to the perfect vacation! We highly recommend this gem! This cabin is perfectly described- “charming private getaway!” THis was exactly what we were looking for, and we found it in this cabin! This cabin has all the luxuries we needed. The kitchen was well stocked for cooking and other necessities, such a wine opener, dish detergent, full-size laundry detergent, plenty of toilet paper. Nothing worse than a rental with a half a roll of toilet paper and you have to buy it on vaca! The porch was our favorite part. You feel as though you are away from all of the world, yet you are a couple of minutes from town! Sitting on the glider, the fan hits you perfectly, and listening to th evening rain fall in he woods; ahhh, just what we needed. My husband said the master shower was one of the best showers he has had. They have great water pressure(our previous highlands cabin did not). We did a little hiking and waterfall watching with our children, and the cabin is conveniently located to many spots for that, as well! My son even left his shoes under the bed, and the home owner contacted me and offered to ship them to us. Holly and her husband were a breeze to work with and we appreciate you sharing your lovely canin With us. Book this before someone else does, you will not regret it!